This has been a momentous week for the lambs. Yesterday all nineteen lambs were ear-tagged and weighed and the males were all banded, with the exception of one which I’ll have to do in about a week. 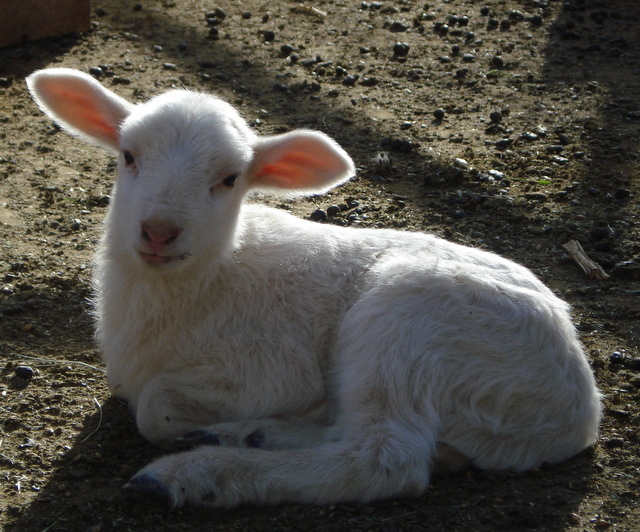 The first lambs were born on March 3 which made them just over three weeks old. 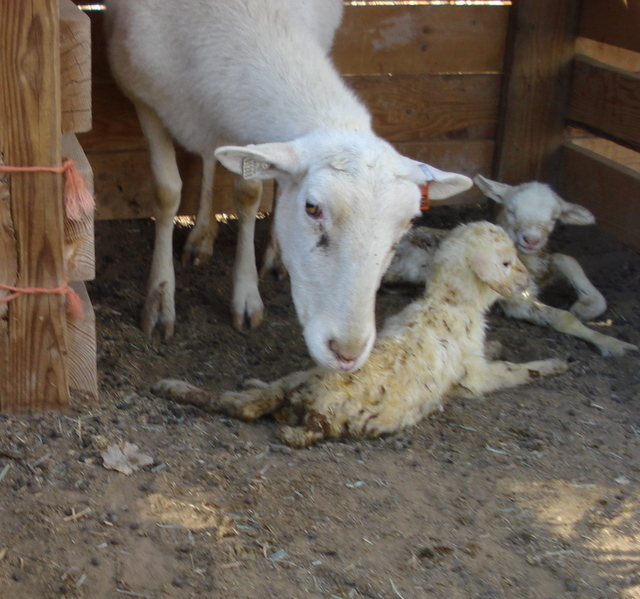 The youngest lambs were born March 18/19 which made them a week old. My smallest lambs were 10 lbs and the largest 15 lbs which is a decent weight gain given the low birth weights this year. This afternoon I turned the ewes and all the lambs out to pasture for the first time. This is not my usual routine. In past years I’ve lambed during the month of February and not put the lambs out on pasture until sometime in April. This is the first time I’ve put lambs out this young. The only pasture I have that is suitably fenced for such small lambs is very sparse right now (and if we don’t get rain soon, may not grow at all this year) and to get to that pasture, the sheep must travel through a section of wooded area from their pen to the driveway, down the driveway and then into the pasture. Just the ewes would not have been a problem. My working dog, Tuck, is well versed in moving sheep out to the various pastures I have fenced. However, I have never before had him work the ewes with such young lambs. The ewes tend to be very protective of their lambs and dislike the dogs in close proximity. And of course, the lambs know nothing about gates so several who weren’t right behind their moms couldn’t figure out how to get out of the pen, or got stuck in the corner behind the gate. The more the lambs cried the more agitated the ewes got and the harder it was for Tuck to keep order. I finally got all the lambs out of the pen and into the working arena where the ewes were milling. I let everyone settle down and then opened the gate out of the working arena and asked Tuck to bring up the sheep. It initially looked to be a smooth process but then as the ewes went through the gate into the wooded area, about half the lambs panicked and either ran back toward their pen or got stuck on the wrong side of the gate. Tuck and I finally gave up on moving the lambs by themselves and went to look for the ewes and remaining lambs. Without a dog behind them the ewes had all drifted this way and that and were scattered amongst the trees. Tuck gathered them up and pushed them back to the working arena. I assembled ewes and lambs again and gave it a second attempt. This time the lambs stuck closer and all got through the gate. Then it was just a matter of Tuck putting enough pressure on the sheep to keep them moving forward without putting too much pressure on the lambs, causing them to scatter and the ewes to be very, very unhappy with him. We had another slight problem going through the second gate onto the drive when four lambs split off. Tuck was able to push one back through the gate and the other three were small enough to fit through the fence and join the sheep. So a task that normally would take Tuck and me about five minutes took us closer to half an hour but finally the sheep were all in the pasture. I kept an eye on them throughout the afternoon and decided after a couple of hours to bring them in as the wind was kicking up again. So Tuck and I duly went off down the drive to the pasture gate. It was a pretty simple task to bring all the ewes and lambs to the gate so I was thinking it was going to be an easy task to get them back down the drive and to their pen. Every time I think something is going to be easy, it turns out not to be. Tuck had evidently decided that ignoring the lambs was the better move, so when the ewes started through the pasture gate he didn’t apply any pressure on the lambs and only ten of the 19 lambs followed the ewes onto the drive. 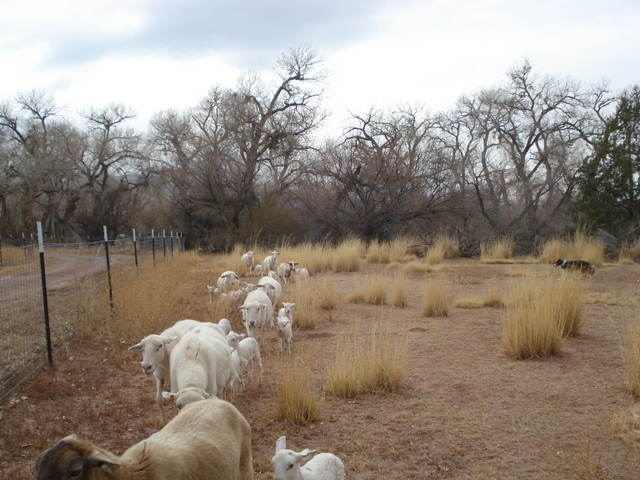 Of course, the ewes immediately headed down the drive and the lambs left in the pasture turned and ran back along the fence in the same direction, bleating piteously. The ewes made it all the way back to the wooded area before a few realized their lambs weren’t with them and then the ewes started bleating and running around. After several abortive attempts by Tuck to group all the lambs and push them back to the pasture gate I finally gave up and called him to me. We walked back through the gate, down the drive and I had him collect up all the ewes and lambs and put them in their pen. I then sorted off four of the ewes missing lambs and had Tuck take them back through the working pen, through the trees and down the drive back to the pasture. Reunited, the lambs stuck very close to the ewes and Tuck was able to turn everyone back again and take everyone home. Moving sheep back from pasture at the end of the day took us an hour and a half instead of five minutes. Lambing is over (I think.) 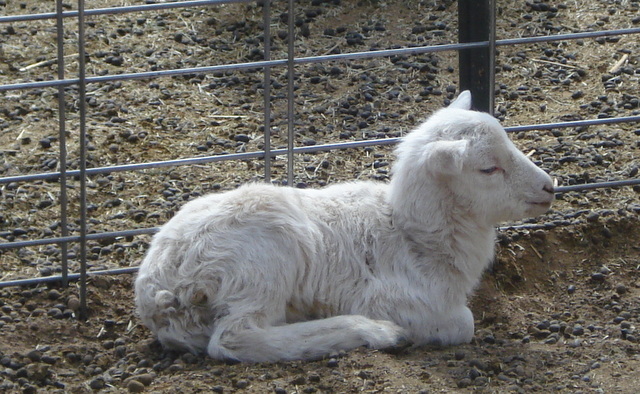 The ewe lamb I kept from the 2012 lamb crop has not given me a lamb so it is possible that I will have one (or two) more lambs but not likely at this point. Total percentages were down from past seasons. This year I had 13 ewes lamb and only 21 lambs. I lost two of the smaller lambs so have 19 lambs. Given that I initially thought none of the sheep had been bred, that is still 19 more lambs than I expected in early February. 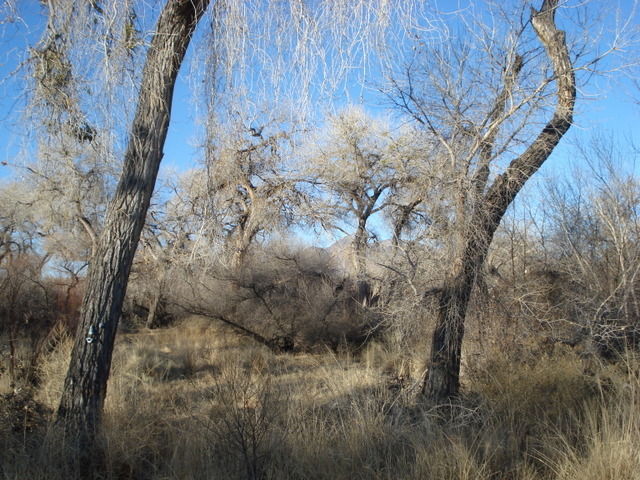 Tagging and banding will take place this coming week. After two easy years of lambing I was unprepared for the trouble experienced this year. It did, however, highlight some changes to implement next year before lambing season begins. My mentor has been telling me for two years now that I need a grafting gate but somehow when it isn’t lambing season there are too many other things that take precedence. Of course that means that when I need it, like this year, it is too late. So a grafting gate is being moved up on the priority list. I will also start next season with an empty pen for sheep in addition to the lambing jugs. Keeping ewes that have lambed in one pen and ewes that haven’t yet lambed in another should eliminate the problems I had this year with not being able to tell what ewes just lambed and who needed to be moved into the lambing jugs. Fourteen ewes do not sound like a lot of sheep until they are all milling around and one is trying to use a flashlight to identify them. A more in-depth update to follow, but no lambs on Monday or Tuesday. Set of twins and one single Wednesday am and set of twins Wednesday pm. 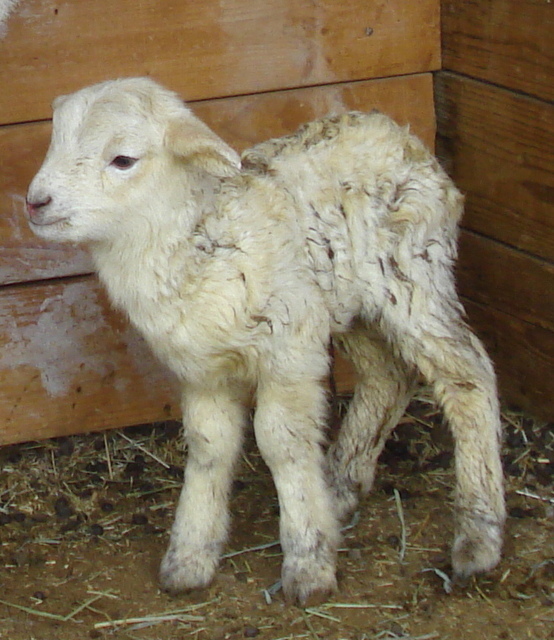 No lambs Thursday. Thursday am lamb — one of the twins. The first year I had lambs I planned on keeping the two best ewe lambs. However, due to a mistake on my part, I ended up selling the best ewe lamb and keeping a cute brown, but lesser quality, lamb. 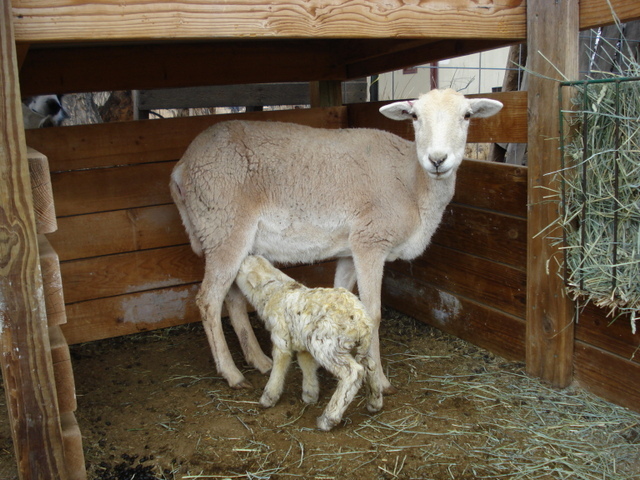 Last season, one of the two ewe lambs I had kept (a tri-colored ewe) had a single lamb. 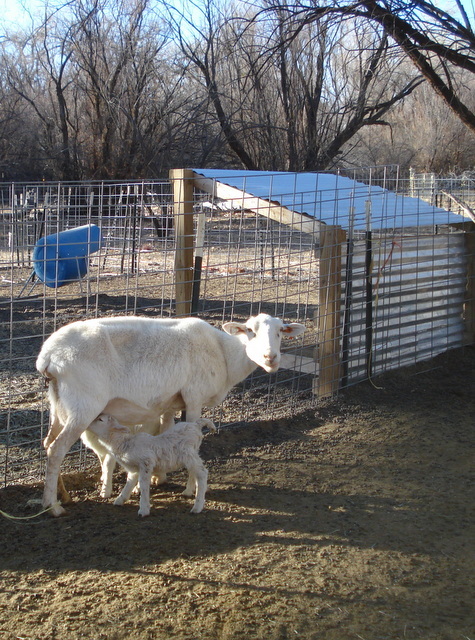 Single lambs are common for first time mothers and often preferable as it lessens the possibility of complications. 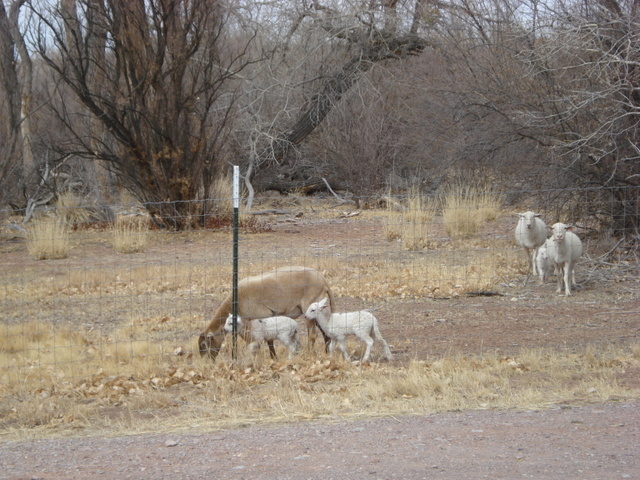 The other ewe lamb (a light brown ewe) did not have a lamb. Since she was still less than a year old and on the small side I wasn’t concerned. This season it appeared that none of the sheep had been bred, and even after some of the ewes started to look a little pregnant and after four of the ewes lambed, the little brown ewe looked just as petite and small as usual. I figured the little brown ewe would be my meat for next year. So I was greatly surprised when I found a single lamb on the ground this morning and upon inspection it turned out that the little brown ewe was the mom. The little lamb had only been partially cleaned off and the ewe didn’t seem to have figured out the connection between it and herself. My experienced ewes could probably manage without being given some one on one (or two or three) time with their lambs and if I don’t have room in the lambing jugs I often will leave the experienced ewe and her lamb(s) in the main pen. The lambing jugs were built though to give the mom a chance to bond with her lambs and eat without competition for a couple of days. This was certainly a case where the lambing jug was needed. So I duly turned the two ewes and their lambs out of the lambing jugs and cleaned it in preparation for the new mom and lamb. Catching the lamb was easy but the little ewe was having none of it and since I won’t use a dog during lambing season, I got my exercise this morning trying to catch the ewe. I did finally succeed and bedded ewe and lamb down in the lambing jug. It soon became apparent I was going to have to help the lamb nurse at least initially so after I finished chores, back into the lambing jug I went. (I will have to admit that the smaller size is a distinct advantage when one has to catch and hold an unwilling ewe.) I think the lamb and ewe have figured it out as when I went out a couple of hours later, the lamb seemed to be nursing on its own just fine. Between holding two ewes on Thursday and this morning, I will shortly be making an appointment with my chiropractor for my neck and back . The lambing jugs were built as cozy shelters for the sheep but they are not conducive for someone, even as short as I am, to spend any time holding animals. 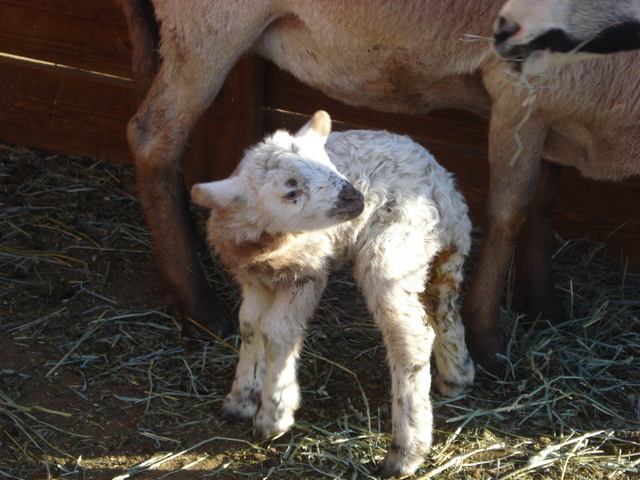 The new little lamb is female and, at 8 lbs, not a bad size for a small first time mother. 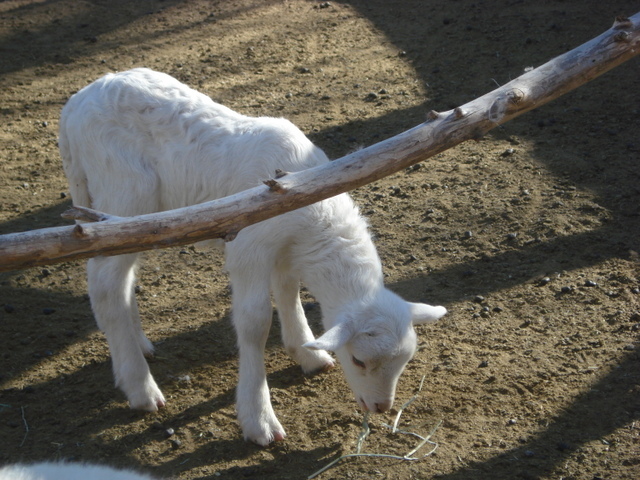 The rest of the photos are of the other lambs. Seven on the ground and nine ewes that may (or may not be) pregnant. Yesterday morning when I put the dogs out I heard the very distinctive sounds of new lambs crying. Still in robe and slippers I went to check and found three lambs scattered amongst the ewes in the night pen. Each was close to a different ewe and each ewe was ignoring the lamb. Seeing me, the ewes came to the fence and the lambs started searching among the ewes for their mom(s). This was not a good sign although all had been cleaned off so the ewe(s) had to have had some interest in the lambs at least initially. When I first decided to raise sheep I was looking for two things: first, someone to buy my sheep from who would continue to be available to me as a resource if I had questions and second, older ewes that were experienced breeders where my potential problems in lambing would be minimized. This scenario of lamb rejection was exactly what I was hoping to avoid. Foregoing the morning coffee, I went back in just long enough to exchange robe and slippers for boots and coat. I threw some hay to the sheep in the night pens and took a quick look at the ewes and lambs currently residing in the lambing jugs to determine if they were ready to be moved back into the general population. They all looked healthy so I turned them out while I cleaned the lambing jugs and prepared them for new sheep. I then searched among the ewes to see if I could determine which ewe(s) had lambed and whether the lambs were all singles, a single and twins or triplets. I found one ewe that looked a likely possibility who was at the feeders rapidly munching and totally oblivious to the crying lambs. It took considerable effort to move her away from the feeders but I eventually sorted her out and moved her to the lambing jugs where I had placed the three lambs. She ignored the lambs and started in on the hay I had placed in the feeder there. I checked ewes again and didn’t see a likely second candidate so I moved the other ewes with their lambs back and finished chores. Back at the lambing jugs, I held the ewe so that each of the lambs could nurse and then went back inside. After a much-needed cup of coffee I went back out to check on the lambs. In looking at ewes again, I found another one that might have possibly lambed so I went ahead and moved her into the lambing jug with the first ewe and the three lambs. I went out periodically throughout the day to check on the lambs. I occasionally held a ewe to allow the lambs to nurse as I wasn’t sure the lambs were nursing otherwise. Last night on my last check, the smallest of the lambs wasn’t interested in nursing and had a very minimal sucking reflex so I wasn’t surprised to find her dead this morning. I’ve had very good luck with lambing the past couple of years so I guess I was due for some of the usual and common problems others experience in lambing. This was a reminder that it isn’t all roses and to be thankful for the fact that my lambing seasons have fewer complications than most. 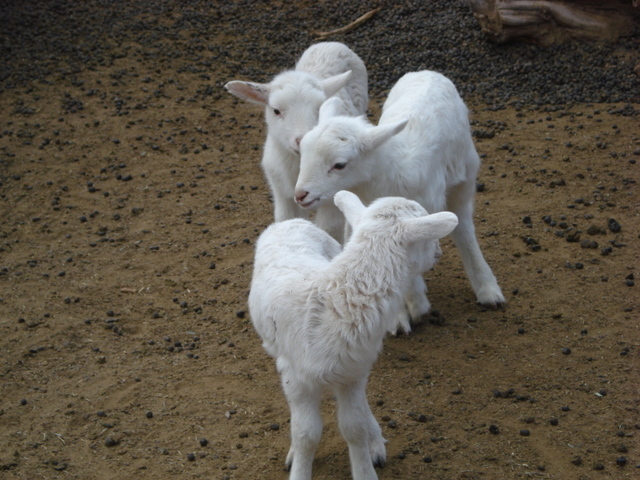 The lambs from earlier this week are all doing fine and are at the gamboling stage which is so much fun to watch. I’ll try to upload video later this weekend. I got home earlier than normal for a Monday afternoon. My first stop was to check on the ewe and lambs currently residing in the lambing jug. As I walked past the sheep pen I saw that one ewe had not gotten up when the rest came to the fence. As I was debating on whether to check on her first, she did get up and there was one tiny hoof visible. 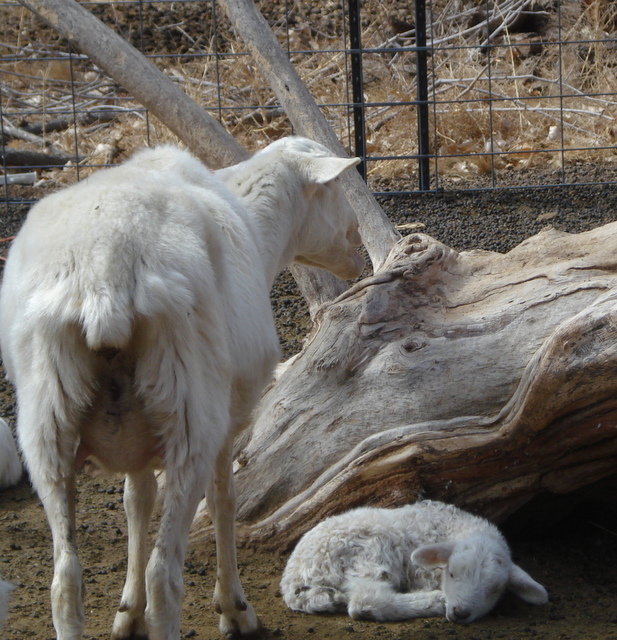 Not knowing how long she had been in labor, I decided to take care of the ewe and lambs and then, if there didn’t seem to be any progress, to deal with the ewe ready to lamb. In the short amount of time it took for me to fill the hay feeder and water bucket, the ewe had delivered a lamb and was cleaning it off. As I watched, she laid down again and out came a second lamb. I quickly got the second lambing jug ready for its new occupants and then threw some hay into the feeders in the sheep pen to keep the rest of the sheep occupied while I moved mom and babes. Still wet and being cleaned off by mom. Weights on these two were 8.0 and 8.5 lbs. And you guessed it — both ram lambs. I borrowed a ram this past fall from a friend to breed my ewes. I bred the ewes about a month later than in past years and calculated the first lambs would be born about the end of February or first of March. However, as the winter progressed I was beginning to doubt that the ewes had been bred as none looked pregnant. The end of January he dropped by to discuss a fencing project and took a look at the ewes. He agreed with me that the ewes really didn’t look pregnant and so we discussed me borrowing the ram back again this spring to breed for fall lambs instead. Within the last two weeks a few of the ewes suddenly started looking pregnant and so I figured that the ram had bred at least some of the ewes but late in his month-long stay so that any lambs would not be on the ground until closer to the end of March. I hadn’t seen any indications that my date estimate was off so I was taken by surprise this morning when I went out to feed and found two small lambs in the night pen. 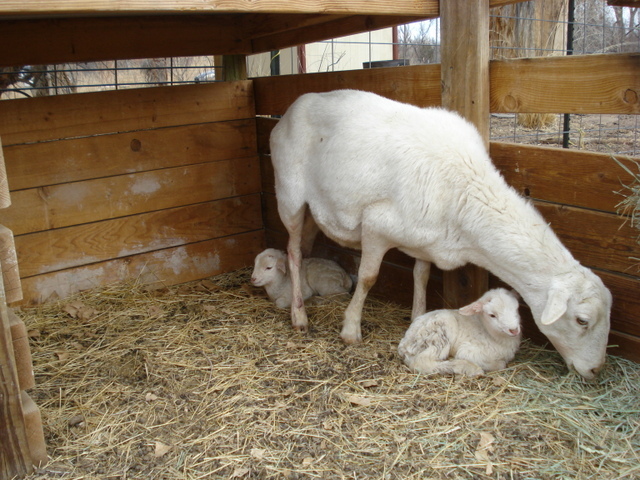 I moved mom and boys (yes, both are ram lambs*) into the lambing jugs, weighed the lambs and dipped naval cords. All are doing fine. This particular ewe had not started looking pregnant until last week and she certainly didn’t look close to imminent delivery. The past two years she had given me triplets. This year she gave me twins, much smaller than last year’s triplets, at only 7 and 7.5 lbs. *for those not privy to last year’s lambing news, in 2012 I had 15 lambs. The first nine were all ram lambs and my final total was 12 ram lambs and three ewe lambs.